Personally, I find air hockey to be the most frantic, nerve-wracking, and anxiety-inducing game I've ever played in an arcade, but that's why I love it. Just thinking about watching a puck blast right past me into the goal while I whiff with the striker thing still makes me sorta nervous . 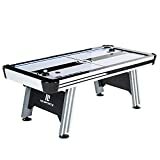 Well, if you agree and wish you could play it at home to keep your adrenaline levels elevated at all times and also happen to love playing pool, then check out this cool new Rotating Air Hockey To Billiards Table. 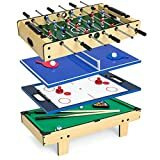 This space-saving, full sized game table combines an air hockey table with a pool table for two times the fun. To use, simply rotate the table table over to your game of choice and lock in place. 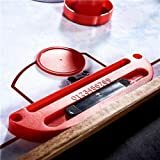 The air hockey side features a glossy white playing surface, a 110-volt blower to keep the puck afloat, and 3" solid rails and heavy-duty aprons to handle the fast-paced hockey action. 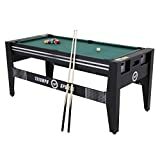 The seven foot pool table side features a warp-resistant, high-density MDF surface covered in a nylon blend cloth and includes the necessary pool cues, balls, rack, and even some chalk. Unfortunately, an fun old-fashioned basement rec room is not included.